As well as being one of the most spectacular of all track and field events, the pole vault is one of the most technically demanding. 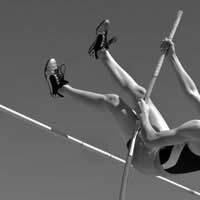 A successful pole vaulter is able to learn complex skills and apply them at the end of a speedy run-up and powerful take-off. The best are fast, brave, strong, tall and agile athletes with great jumping ability. It is a sport with a long tradition too, as the men’s event has featured at the Olympics since the inception of the modern Games in 1896. The women’s event was added to the Olympic programme in 2000. The importance of safety in the pole vault cannot be overemphasised. Sand pits, when used for teaching purposes with straight poles, should be well dug and free of dangerous objects, poles checked for damage and handled carefully to prevent damage. Landing areas must meet the minimum requirements in terms of size and must be securely fastened together at all times. Pole vaulting should not take place in adverse weather conditions. All athletes now use fibre glass vaulting poles for both training and competition. Poles vary in length from 3.10 metres to 5.20 metres and are manufactured to suit athletes’ body weights from 40 kilograms to 100 kilograms. Selecting the right pole specification is vital. An athlete should choose a pole he can grip in the top 15 centimetres of and one that is the right weight to allow a successful vault. If the pole is too long or too stiff, the athlete may fail to reach the landing area, possibly sustaining serious injury. If the pole is too soft the athlete will either fail to carry out an effective vault or break the pole. Poles must be properly cared for. They must not be allowed to fall against hard or sharp objects and should not be left lying on the ground in case an athlete wearing spiked shoes treads on them. The bottom 15 centimetres must be bound with protective tape to prevent damage to the pole when it bends and strikes the back of the plant box. The landing area must measure not less than 5 metres by 5 metres and be at least 80 centimetres deep behind the box. The two protection pads on either side of the box must measure less than 2 metres from the back of the box and the stands may be moved to a maximum of 80 centimetres away from the back of the box. The runway must be level, between 1.22 metres and 1.25 metres wide and must measure not less than 40 metres long. It should be swept regularly to remove any excess water or sand and examined to ensure there are no worn or damaged areas. If a wind sock is available, site it off the runway but near to the take-off point to indicate the wind direction and strength at the point of take-off. The plant box should be adequately maintained and regularly inspected and must meet the correct specification. It has to be is clearly visible with good drainage to prevent it filling with water and should be covered when not in use. Pole vaulters should be sufficiently competent to avoid injury to themselves and others and athletes should not wear jewellery or other objects which might cause injury.